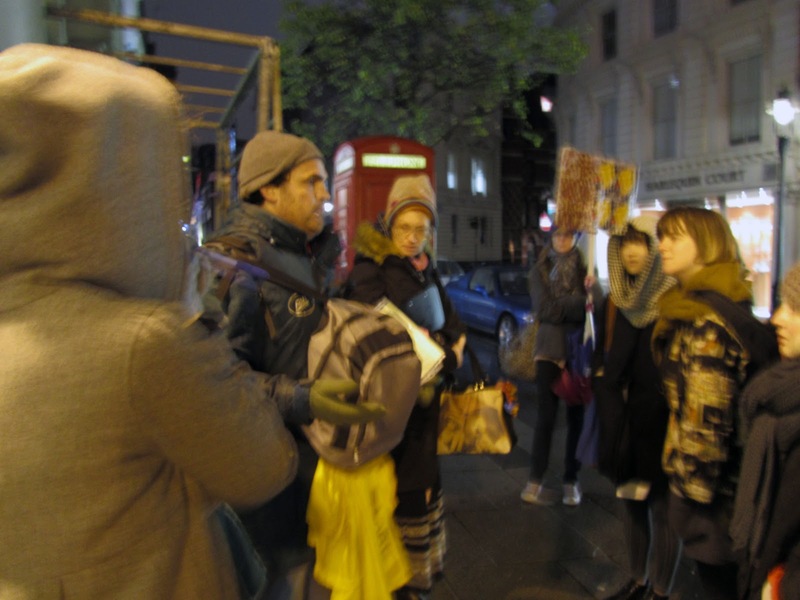 This week I went on the unseen tours of Londons Street voices, a tour run by the homeless. They walk around Temple, Shoreditch and London Bridge stopping at landmarks offering information and personal stories. It is ran by sock mob and offers a really interesting insight into sleeping rough, I met two really inspiring people called Viv and Mark. The tour offers raw information and opinions that cannot be found on the internet and books. Their natural instinct with regards to finding useful materials is clear, Viv curiously picked up an old sock whilst on the tour, mistaking it for a glove. Her intrest into re using materials was really natural, and blatently supported her memories from tent and cardboard city along with her knowledge of making bashes. I went to do research into my current project that focuses on re using and recycling textiles into methods of storage from locally sourced materials. I feel the homeless have great initiative and instinct in terms of resources and this project would be the perfect oppurtunity to generate employment for them and a way of expressing their creative skills. This is similar to the work of Emmaus, they integrate the homeless into society by offering jobs in furniture restoration from found items. One of their main concerns is to reduce pieces ending up in landfill.